A United Launch Alliance Delta 4 rocket vaulted away from Cape Canaveral Friday and lofted a $342 million military communications satellite into orbit after a picture-perfect climb to space. Running a day late because of trouble with a launch pad helium system, the 217-foot-tall Delta 4's RS-68 main engine ignited and throttled up to full thrust at 8:27 p.m. EDT (GMT-4), followed an instant later by ignition of four strap-on solid-fuel boosters. Trailing a billowing cloud of churning exhaust, the towering rocket majestically climbed away from launch complex 37 at the Cape Canaveral Air Force Station, putting on a fiery evening sky show as it climbed into sunlnight and arced away to the East over the Atlantic Ocean. The solid fuel boosters burned out and fell away two at a time about a minute and 40 seconds after liftoff. The Pratt & Whitney Rocketdyne RS-68 engine shut down two minutes and 25 seconds later, the first stage fell away and the rocket continued toward space under the power of a single RL10B-2 second-stage engine. This was the first flight of an RL10B-2 powerplant since a propellant leak caused a loss of power during launch of a military navigation satellite last October. Despite reduced thrust from the Pratt & Whitney Rocketdyne engine, the GPS made it into the proper orbit, but the malfunction triggered an extensive investigation. While that investigation remains open, mission managers cleared the Delta 4 for launch after carrying out additional inspections and implementing operational changes. Those efforts appeared to pay off Friday as the Delta 4's second stage engine fired normally for just over 16 minutes to put the spacecraft into a preliminary orbit. A second three-minute firing finished the launch phase of the mission and the Wideband Global SATCOM 5 satellite was released into an elliptical orbit with a high point, or apogee, of 41,572 miles and a low point, or perigee, of 272 miles. Over the next few weeks, the Boeing-built satellite's on-board propulsion system will be used to circularize the orbit at an altitude of 22,300 miles above the equator. In such geostationary orbits, satellites take 24 hours to complete one trip around the planet and thus appear stationary in the sky as viewed by users on the ground. The WGS 5 satellite is the fifth in a constellation of geostationary relay platforms that were designed to replace earlier Satellite Communications System spacecraft. The new satellites have 10 times the capacity of the relay stations they are replacing and will provide enhanced communications and expanded coverage for the United States and six international partners, providing "near-worldwide coverage," Luke Schaub, a senior manager at the Air Force Space and Missile Systems Center in Los Angeles, told reporters before launch. "With operational acceptance of WGS 5, we will be able to achieve full operational capability of the system." The 13,200-pound satellite features X-band and Ka-band communications and can support data rates up to 3.6 gigabytes per second. "WGS is the DOD's highest capacity communications satellite system," said Boeing WGS Program Director Mark Spiwak. "These satellites provide tremendous operational flexibility to deliver the needed capacity, coverage and connectivity in support of demanding operational scenarios for DOD and allied forces worldwide." The other four members of the WGS constellation "are pretty much located on the other side of the globe from the United States," Schaub said. "They're really located strategically between the eastern Atlantic and the western Pacific. Today, we do not have any WGS capability over the continental United States. "This satellite is being launched into an orbit at 52.5 West, which is off the East Coast of the United States, with the intention of closing that gap and providing ... near-worldwide coverage." 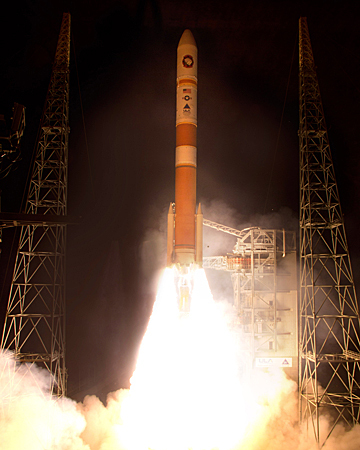 This was the 22nd launch of a Delta 4 since 2002, the 18th launched from Cape Canaveral, and the 15th managed by United Launch Alliance, a partnership between Boeing and Lockheed Martin. Next up for ULA is an Atlas 5 scheduled for launch July 19 to boost a MUOS mobile communications satellite into orbit.